Savor the creation process. 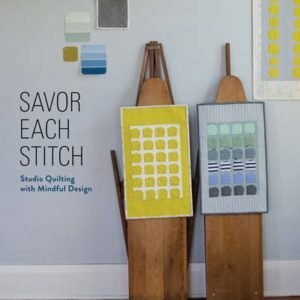 In Savor Each Stitch: Studio Quilting with Mindful Design you are encouraged to enjoy the entire process of making a quilt, not only the finished project. Follow the leader. You can choose to follow the book's inventive patterns or branch out on your own creative trail. The variety of techniques and experimentation with fabrics will appeal to quilters, who are looking to take time with their work–to savor the creation–of lasting, one-of-a-kind pieces. You are guided by thoughtful instruction, colorful illustrations and over 100 photographs of zany, bold, bright and beautiful quilts.